Nowadays, outdoor activities for children can be limited without the freedom to build dens; play in the woods; and experience the outdoors. 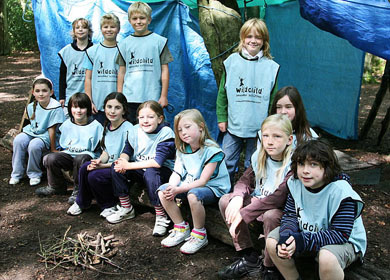 Our Wild Survivor Easter and Summer holiday activity days will encourage your child to work as part of a team, make new friends, develop new practical skills and enjoy the increased self-confidence and reliance that comes with it. Children will learn how the natural resources around them are used by Outdoor Explorers to survive in the wild. Wild Survivor Adventure Day is a brilliant opportunity to experience the outdoors, to work as part of a team, make new friends, develop new practical skills and enjoy the increased self-confidence and reliance that goes with all of that. Safety: All safety equipment provided. Instructors are extremely experienced and do not allow anyone to attempt anything they feel is dangerous. All instructors are CRB checked. Clothing: Outdoor – dress according to weather. Appropriate sturdy footwear and loose clothing. Group Discount Offer: Book any holiday activity for a group of 4 or more and each child will get 25% off. Discount applies when booking a minimum of 4 children on the same holiday activity. You will need to choose the group booking option on the booking form and provide the names of all group members. A booking form will need to be completed for each child by or on behalf of their parent or guardian (siblings can share a booking form as long as any medical conditions are clearly detailed for each child). Early Bird Discount Offer: Summer bookings received before 30th June qualify for 10% early bird discount. Sibling Discount Offer: Siblings qualify for a 10% discount off any holiday activity booking/s. “Myles had a wonderful time at the bushcraft day -He was very worried about not knowing anyone, staff were great, other children friendly, great day, he is already asking when he can go again”. “The activities are great, you offer a unique experience, good value for money, excellent staff,fabulous venue, would strongly recommend”. “With school in full swing mode, summer holidays are now a distant memory! But Ekua and Kwame had a great time with you in the summer holidays. They enjoyed being in the woods and different activities they were involved in”.